The Dynamo Escape is unlike any company away weekend I’ve ever been on, largely because no one knows where they’re going until the morning of the trip. We were told to pack a passport and clothes for weather similar to the UK, that’s all. Following a series of drip-fed clues on Pinterest, at 9am on Friday, it was announced that this year’s Dynamo Escape destination was Copenhagen! The largest Dynamo away weekend to date, all 16 of us were handed a mini itinerary (still very ambiguous) and made our way to Stansted Airport. We were also briefed as to the theme of the weekend, and set tasks and training to complete – over the next few days we were going to explore the Danish creative scene, hear from local experts, and expected to draw from architecture, design and cuisine inspiration for our work with our clients and building Dynamo throughout the rest of the year. Before we knew it we’d landed, checked in, and were bonding over Denmark’s finest, Carlsberg. Our first night in the Danish capital ended with an early nightcap in a pop up cocktail bar on Kompagnistræde Street, ahead of a mystery morning ‘biking activity’. As we walked towards a row of what looked like tricycle-come-scooter-come-Segways, our first activity of the day was about to be revealed. 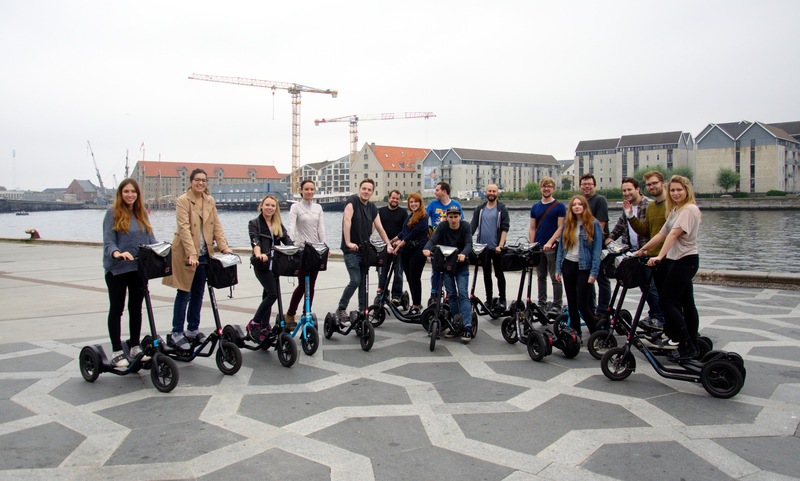 We were going on an architectural tour of Copenhagen on Me-Movers. The three-hour long tour took us from the outskirts of the city into the centre, via new and historical landmarks including the harbour, quirky new-build flats and ‘Mountain Dwellings’ an award-winning designed multi-storey car park and home combination. After sampling an open-sandwich by the canal in the Nyhavn district, our next stop was the theme park Tivoli Gardens. Armed with a multi-ride ticket we were ready to scream our heads off and get our adrenaline pumping. From ‘The Demon’ to the dodgems, to the oldest running wooden rollercoaster in the world, we made the most of our time in the theme park. There’s always those who aren’t coaster junkies, but the full Dynamo team stuck together and took a group ride on the famous wooden rollercoaster. Before flying out we had been split into teams to work on a number of tasks for Dynamo, so between showering and getting ready to go out for dinner we met up in our respective groups to start brainstorming ideas and work up our presentation slides. The Kickstarter, mobile, digital and design teams were all mixed up giving us an opportunity to work together and share our different perspectives on the task. There may have been a few weary heads in the room, but everyone made it down to breakfast in time and presentations kicked off at 11am sharp. It was refreshing to see so many creative and different ideas, and everyone presenting across the agency. There was a prize for the best pitch so the heat was on, and each team stepped up to the challenge. Post the final pitches, our last day in Copenhagen was free for us to do as we wished. Many took advantage of the hotel spa, whilst others went sightseeing, shopped and checked out the local flea market. The #DynamoEscape lives on and I can’t wait to see where we go in 2015!